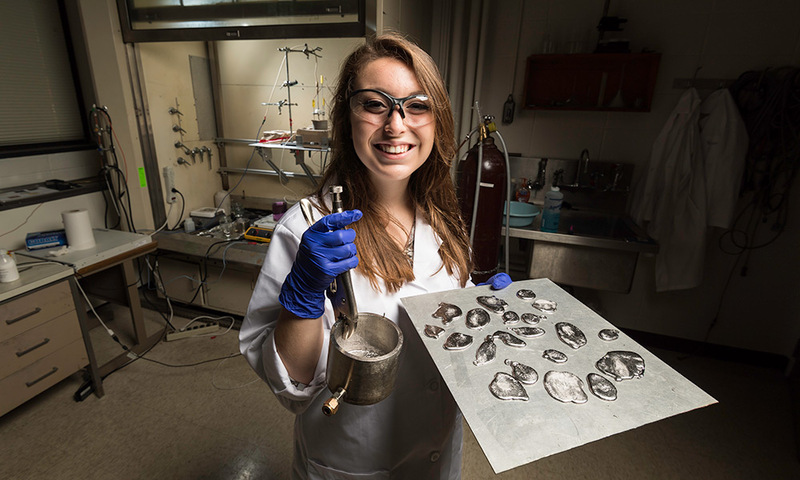 Summer of Research: Our latest Newscenter series showcases a cross-section of summer research conducted by undergraduates at Rochester and beyond. Kelley, an assistant professor of mechanical engineering, received a coveted National Science Foundation CAREER grant to study the use of liquid metal batteries on a scale large enough to power entire cities or regions in conjunction with solar and wind power. Specifically, he’s looking at how the flow of fluids in those batteries affects their ability to perform as a backup source of energy when clouds or calm conditions interrupt solar and wind production. “We want our energy grids to be stable. But to keep them stable with lots of intermittent wind and solar generation, you will also need stored energy that can charge and discharge seamlessly on the grid to ensure efficient operation,” Kelley says. Patrick, a Xerox Engineering Research Fellow, is helping the lab figure out where to place ultrasound probes in liquid metal batteries in the lab. These probes can then capture detailed measurements of how fluids flow in those batteries and how that affects their performance. The lab could then create mathematical models that predict battery efficiency and stability in the field—where probes are impractical—based solely upon what an operator would know: how much current is running, the amount of charge, the temperature. As part of this work, she regularly employs MATLAB, Creo CAD software, hands-on experimentation, and machine shop fabrications. Patrick’s time as a Xerox Fellow has given her unique insights about the research process, ones she never would have gained otherwise. Her experience this summer will also help her answer the question nearly all engineering seniors confront as graduation nears: Will you go into industry or graduate school?